1 What are Taste Buds? 3 What is Inflamed Taste Buds? 7 When to call a doctor? 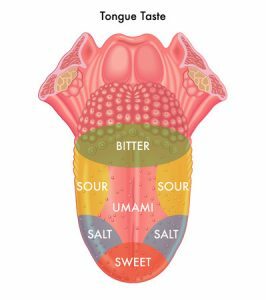 The tip of the tongue responds to both salty and sweet foods. The sides are for sour and the back of the tongue is sensitive to bitter tastes. Fungiform papillae are the most typical types found on the tip and edges on the tongue. These help us to taste different flavors as well as to check the temperature of the food items. Circumvallated papillae lay at the base of the tongue. They are mostly large and round and are the house of several taste buds. Foliate papillae clusters at the back edges of the tongue. Each of them contains hundreds of taste buds. What is Inflamed Taste Buds? Taste buds placed inside the tiny bumps lining the tongue can become enlarged or swollen. This swelling can cause on any one side of the tongue or cheek, soft palate and other parts of the mouth. Hot beverages: Sipping hot coffee/tea and even any hot food might lead to irritation and swelling of the taste buds. Spicy foods: Eating spicy foods, peppered items which might cause irritation and swelling on the buds. Infection: Viral infections in the mouth may cause inflamed and swollen taste buds. Trauma: Might get irritated even due to various traumas such as burning your mouth with hot foods, tongue biting or rubbing can result in swelling. Allergic reactions: Several foods and dental products, mouthwashes and medicines may cause swelling or inflammation in the taste buds. Some seafood, citrus foods are also a cause of allergies in the mouth. Tobacco and alcohol consumption: Chewing of tobacco products or even use of alcohol can be a reason. Smoking cigarettes irritate the taste buds making them dull resulting in the inability to identify different flavors. Stress and depression: Prolonged stress and mental issues are also a cause for irritation and inflamed taste buds. Long periods of stress create a hormonal imbalance and thus weaken the body immunity. Mouth diseases: Diseases like oral cancer, mouth ulcers, and oral thrush are a source of swelling and inflammation. Acid reflux: Regurgitated acid after entering the mouth can be too strong to handle and can irritate the tongue and especially the buds. It causes swelling in the taste buds. Vitamin deficiency: It may result in the sore tongue and inflamed taste buds. Vitamin C, vitamin B complex, and iron are the primary source for the good health of oral cavity. A lack of these leads to the swollen tongue and enlarged taste buds which again are symptoms for Scurvy. Tongue piercing: After getting the tongue pierced, infections might occur leading to inflammation, irritation, swelling, redness and even bleeding. Also discoloration of the tongue, discharge of fluids or pain may be a result of piercing. As a result, swollen taste buds at the end of the tongue or the tip may get inflamed. They get enlarged and even cause burning at the edges of the tongue with a tingling sensation on parts of the tongue. Dehydration: Dry or dehydrated mouth or throat may also lead to swelling of taste buds. When dry, they are more prone to irritation. Type 1 (HSV-1) or oral herpes: They cause sores on various parts of the mouth and tongue making the taste buds very swollen and painful. Type 2: Also known as syphilis, it causes sores on the mouth and lips making the taste buds inflamed. Type 3: A form of oral gonorrhea, it leads to itching, sore throat and difficulties in swallowing. White or yellow discharges are also present causing swelling in taste buds. They might even touch the surface of the tongue to check if any lumps or pain is present. In case, he finds a symptom of oral cancer, and he would advise a biopsy. This test will need to remove a small sample of tissue from the tongue for examining. Drink cold beverages instead of hot drinks which would help to sooth the tongue. Swelling of taste buds is a common issue, and it happens due to spicy or allergic reactions in the tongue. It usually disappears rather quickly after few hours or days on its own. In case of infection, the swelling won’t go until the infection gets wholly cured. At times when the situation gets serious, the home remedies won’t work. In case of prolonged swelling of the taste bud for about a week, the doctor and proper medication are required.